For leftover stilton or ham. 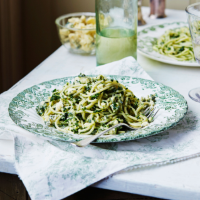 This pesto is so versatile – toss it through pasta, spoon over veg or spread on toast and top with goats’ cheese. It’s also fantastic with walnuts blitzed into it. 1. Blanch the kale in a large pan of boiling water for 1 minute. Drain and rinse under cold running water. Squeeze out the excess water, then dry thoroughly on kitchen paper. 3. To serve, cook the pasta according to pack instructions. Drain, reserving a cupful of the cooking liquid. Return the pasta to the pan, with the pesto and a glug of the cooking liquid; cook until the sauce has emulsified. Toss through the ham or stilton and serve immediately.